We are fine. We are more than fine. Living in Corpus Christi, seeing the news in the days leading up to Harvey was terrifying. Initially, it was a tropical storm, then a category 1 hurricane. The day it became a hurricane, my employer let us out early to prepare. I moved valuables as high as I could should water come in. I moved stuff off the floor. I put every towel and blanket we owned near doorways that water could get in from. Given how quickly things escalated, I had about five hours to do all this before Daniel got home and we loaded up and hit the road. When deciding what to take with us that I absolutely couldn’t live without, all I took were my external hard drives filled with family, wedding and vacation photos. Everything else I decided was just stuff. The most important “things” to me, Daniel and Pee Wee, were with me, so all was well even if I lost everything else. My former boss lost so much, a blogger who lives nearby lost her home, and there’s so many more stories. My heart goes out to those dealing with the aftermath, and Daniel and I have been doing what we can by getting donations out to local organizations and seeking volunteer opportunities. Our new home is fine, and we are so very thankful. We’ve been back home a week now, and we’re slowly getting back to our normal routine after a whirlwind week. We’re anticipating that we will still be able to close on the house next Friday. Lots of progress has been made. 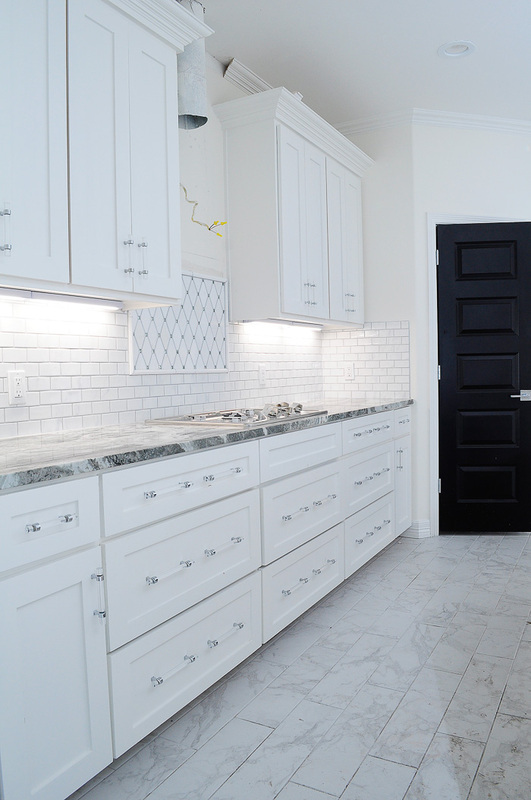 The under cabinet lighting is in, and it was worth the splurge. 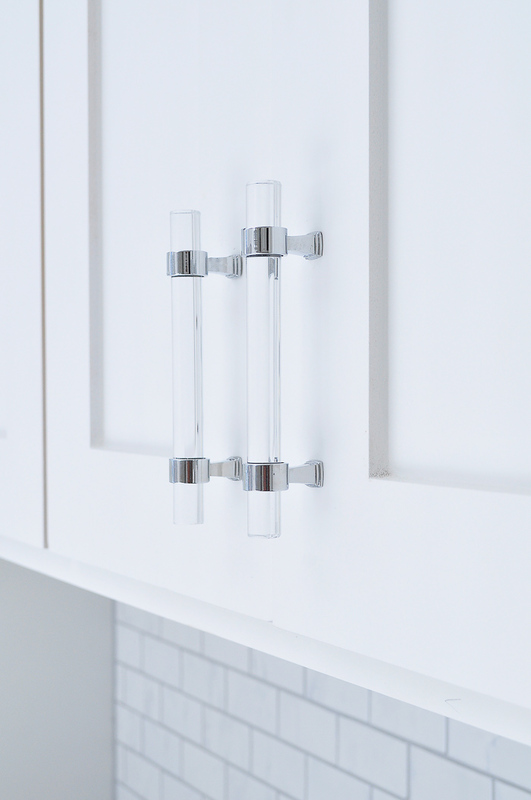 The lucite cabinet pulls (they are RIDICULOUSLY CHEAP…click here for info) look amazing. They’re sturdy and look so glam. I used them all over the house for the sake of continuity. 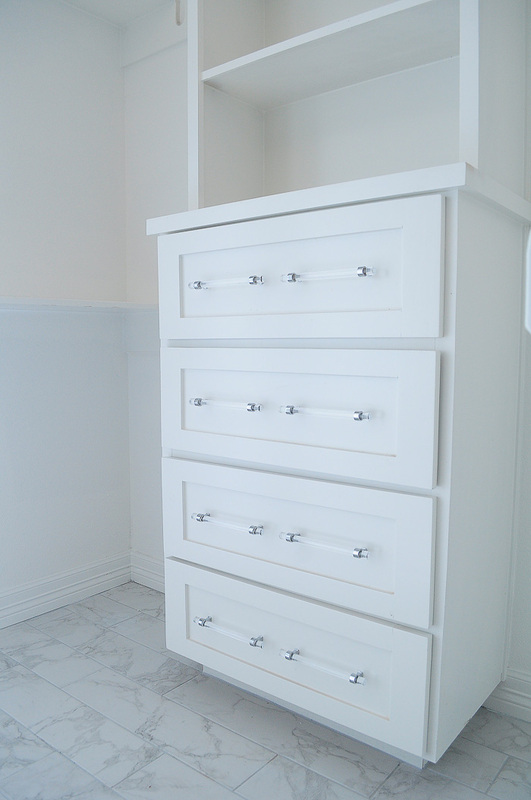 Here they are in our master bedroom closet. My tile accent above the cooktop looks phenomenal, and I will love it always. 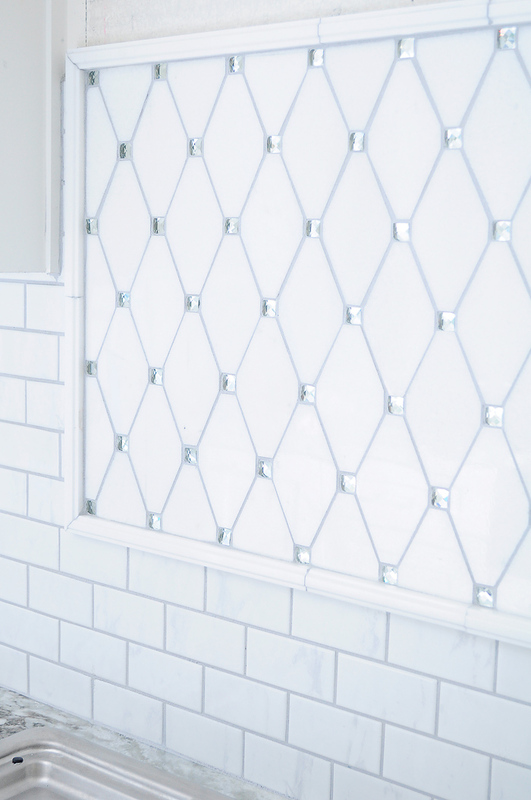 The grout makes the tile and glass diamonds pop. 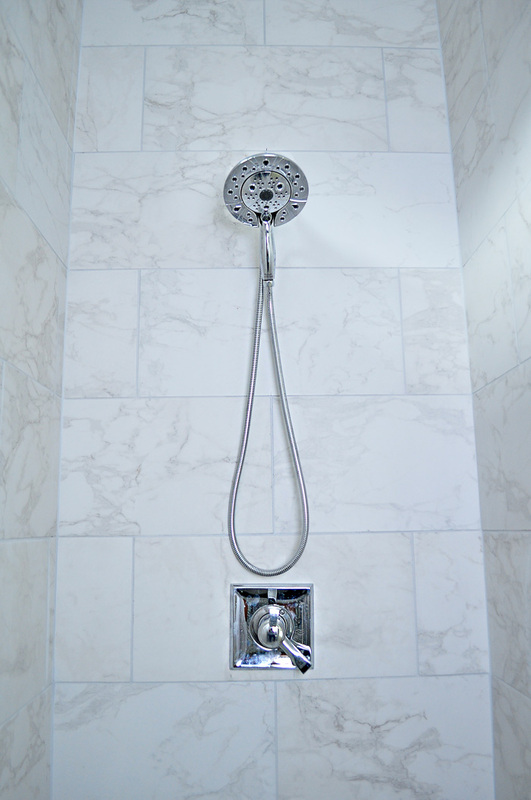 And finally our master shower is almost done and feels so airy and luxe. That tile is only $2.48 a square foot. I’ll have more photos soon, but for now those are some of the highlights. They had to remove the decorative vent hood because the range hood didn’t fit in there, so hopefully it’ll be in soon so I can see my full kitchen done! WOW! It all looks great. So glad everyone stayed safe during the hurricane. I'm so relieved that you and your family are fine. 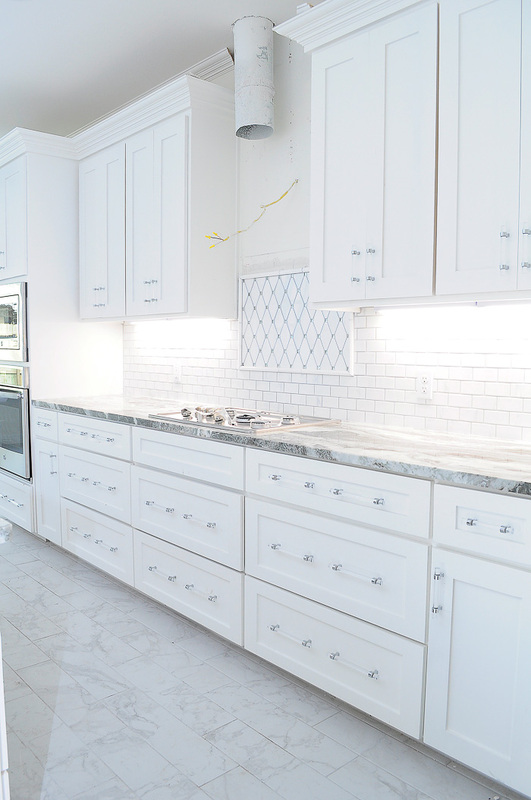 Thanks for sharing your beautiful kitchen progress with us. You've been in my thoughts and prayers . So glad you are all fine and the house looks amazing. Such a Blessing.